A child recently suffered minor injuries after a surge of gusty winds blew a bouncy house from his Adelanto, California home onto a nearby highway. The San Bernardino County Sheriff’s Department reported that high winds blew the bounce house—with the 9-year-old boy inside—onto the roadway a few hundred feet away. According to the Los Angeles Times, the bounce house rolled on the freeway and then struck a vehicle, at which point the boy fell out. Fortunately, his injuries were limited to only scrapes and scratches. The driver of the car wasn’t injured, but reported to be extremely shaken up. Sgt. Marc Bracco of the San Bernardino County Sheriff’s Department told the Times it was a “freak accident,” and said in his nearly two decades of law enforcement, he had never seen a bouncy house fly so far. “The kid got lucky,” he said. Bounce houses are extremely popular for backyard parties as well as popular with kids. However, they can also be dangerous, and sometimes these dangers are due to negligence. In accidents with inflatable houses and slides, victims can suffer injuries like broken bones, neck injuries, spinal cord injuries, or other serious trauma. Renter. The individual or organization who rented the bounce house could be liable if they were negligent in properly supervising the children using it, installed it improperly, allowed too many children in it at once, and more. This can also apply to an individual who owns a bounce house. Business owner. When a business has a bounce house, it is their responsibility to maintain, repair, and replace it when necessary. They must also properly train their employees in safe use. They can be held negligent if they fail to do these things and a child is injured. Operator or supervisor. Whether the person is operating the bouncy house or whether they are supervising that person, either can be considered negligent in the event of an accident. Installer. 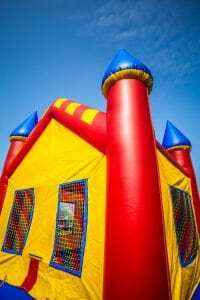 Many times when an organization or individual rents a bounce house, the business installs and breaks down the house as part of the rental agreement. If an improper installation leads to an accident, the installer may be liable. If your child was injured in a bounce house accident, they may be entitled to compensation for their injuries. Serious accidents can lead to expensive medical bills as well as pain and suffering. The personal injury attorneys at Taylor & Ring in Los Angeles are ready to help you and your family. Call us today at 310.776.6390 or complete our contact form to schedule a consultation.